Quickly… and Have Fun In The Process! At Language101.com, we are serious about language learning… and we make learning a new language fun at the same time. Learning a foreign language is what we call a “high-leverage” skill. It’s a skill that allows your students to learn physics, math and chemistry in a new language… or any other subject matter as well. In other words, foreign language competence multiplies each student’s effectiveness. This is one of the reasons why our mission includes reaching out to foreign language teachers… to provide folks like you the very best tools to help your students learn. And that’s where our unique language learning software comes in. When you (and your students) learned your first language, your brain developed the means to automatically filter out sounds that weren’t in your native language. Unfortunately, this same filtering process makes it hard to distinguish new sounds when you (and your students) try to learn Russian, or Spanish or any another language. Our software solves this problem by providing sound clips that are played at both slow and normal speeds. This dual-speed system gives your students the assistance and flexibility they need for successful language learning. Our software prompts your students to review an item just before they would be most likely to forget it. This forms firm memories faster. As a result, they won’t waste time repeating things they already know well. Ultimately, your students will have a method to remember what they learned in your class… not only for the next test, but for a lifetime. We all need a little help from our teachers sometimes, wouldn’t you agree? That’s why we’ve built a unique back end to our language learning software. Well, it’s a win-win because both you and your students can monitor results together. You’ll be able to see what your students studied, how they have graded themselves as well as what they are finding difficult. This makes pinpointing areas that need help much easier for both of you. When you login to the member’s area, you’ll see the “My Stats” page. 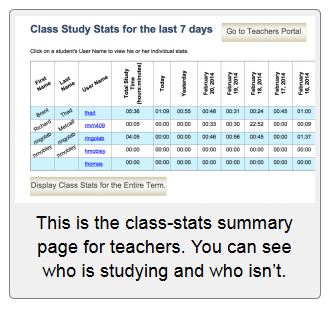 This page shows you and your students what they studied, what they are having trouble with (and need your help with) and how much they have studied. 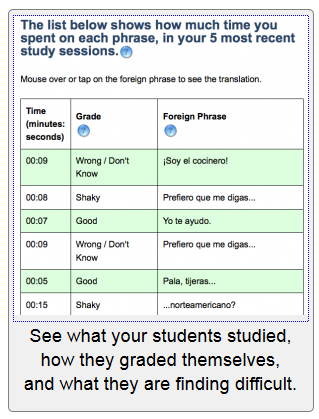 What’s more, you will also see exactly what grades they have given themselves, and you will know if they are using Language101.com in an effective way or not. This “collaborative” learning approach helps take the pressure off both student and teacher… while at the same time encouraging diligence and practice. In a way, you become a cheerleader as well as a teacher, cheering on each student to cross the finish line a language learning winner. Our current lessons at Language101.com are ideal for teaching beginning students to speak and understand a foreign language. These lessons take your students from knowing nothing to being able to carry on a simple but useful conversation. When a student completes all our lessons they should achieve a CEFR B1 language competence level. The focus in the software is to give your students practical foreign language skills that provide a solid foundation. This complements your expertise in providing the writing, spelling, and grammar exercises that can be taught more effectively in a classroom setting. In other words, you can leave the 100 repetitive reviews a student might need to us! As a bonus, you can add your own lessons inside the software as well. This flexibility allows you to use your creativity and knowledge to provide the very best foreign language education you possibly can. Any lesson that fits our format can be added. Let us make a bold claim in saying that our software is dramatically more effective than anything else on the market for teaching beginning language students. That said… you shouldn’t believe it just because we say it’s true. Nor should you rely on the many testimonials of students who are thrilled to have learned a new language with our help. Instead… have a couple of your bright beginners try our free demo for 30 minutes. Then have them try a free demo of any other program you are considering. Watch our video instructions first, then try our free demo for the languages you are interested in. Next… check with your students in a couple of days to see which program helped them remember and learn the most. Your decision will make itself. We’re confident you’ll find our language learning programs superior to any other software out there. Our methodology is fast, fun and a scientifically proven way to learn… and it makes your job fast, fun and effective as well. As part of our mission to provide foreign language teachers with the best tools and support possible, we’ve pleased to offer you bulk discounts when ordering lessons for your students. Use the form below to contact us for the pricing details, and to ask any questions you might have as well. One of our representatives will get back to you within 24-48 hours.